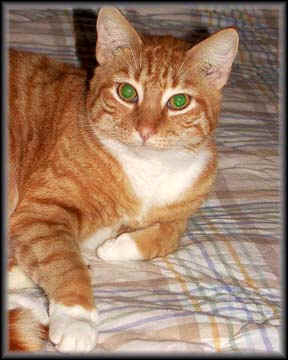 Ollie is about 2 yrs old and has been "unadoptable" due to his shyness. He needs a sponsor - that special someone to help provide for his needs as he will always be a permanent resident. The annual fee to sponsor Ollie is $240.00 which may be paid in a single yearly lump sum, in quarterly payments of $60.00 or in monthly payments of $20.00. In return, you will receive a photo of "your" cat, with a brief history, periodic updates and quarterly newsletter. Also your name will be posted on this page. Print this form and send it along with your contribution.